Paws with Opulence is a company based in London specialising in selling handmade collars for extra small to medium dogs. One thing I love about these products is that they can be customised with ID tag engraving or handwritten embossing on the collar themselves. They sell collars, leads, ID tags, beds and bows. I was lucky enough to be sent 3 designer dog collars* from Paws with Opulence, and I have to say, these are stunning collars. I'm very happy I got the chance to review these, and Daisy very much enjoyed being my model again. I'll review all three together as they're fairly similar. First thing I love - they're handcrafted - I love handmade items. I feel like they have something special about them. They have more love and effort put into them, and I always like to support small companies that make their items by hand. They are all very well made and feel both thick and sturdy. I particularly like the nubuck texture on the inner lining of the collar so it is more comfortable around Daisy's neck. The buckle fastening is robust and appeared better quality than other buckle collars I've tried. I actually moved away from metal buckles as they kept breaking previously. So the quality of these buckles is one of the first things I noticed. All these collars have the Paws with Opulence logo embossed on the inside, which I think shows pride in what they have created. 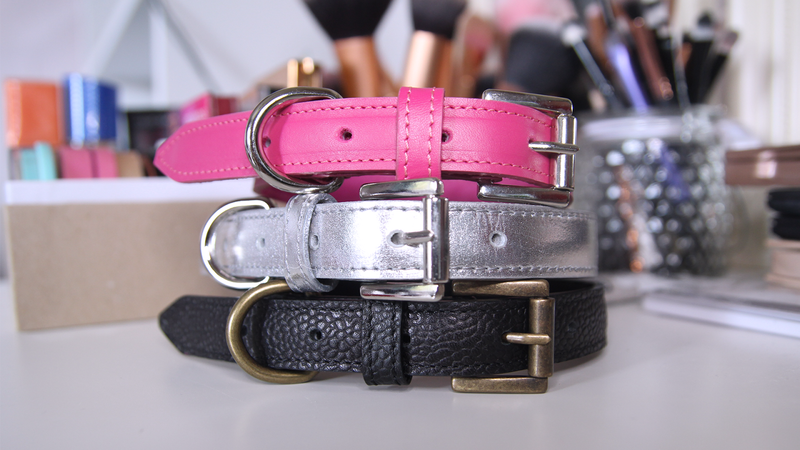 I think the pink collar is probably my favourite one. I love how vibrant the shade of pink is, and how it compliments the colour of Daisy's fur. Of course, she tends to always wear pink - she's a girl. I just really like how pink looks on her. The leather on the outside is very smooth and the silver hardware stood out against the dark pink. I quire like the size of the silver hardware. It's like it's a main feature of the collar, almost like a the charm at the end of a necklace. I really like the metallic collar. I like most items that have a metallic finish to them. I think this collar would have looked better on a dog with darker fur. The photos really don't do it justice up against my white dog. 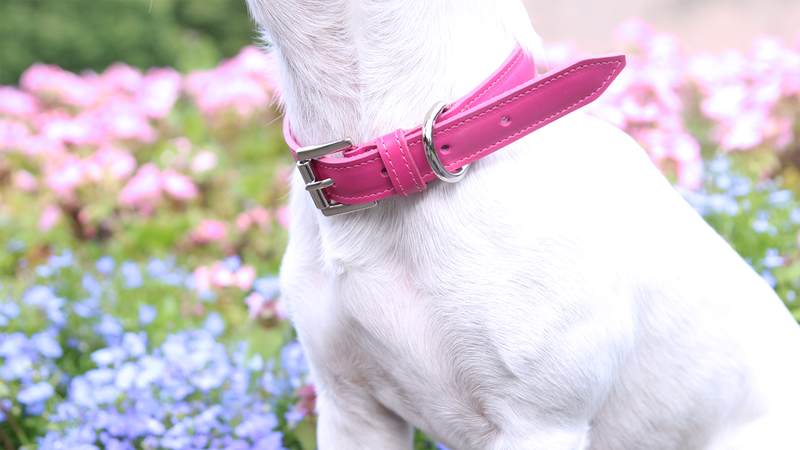 It's smooth just like the pink collar, but has a nice shine to it. It almost reflects the sun, as you can see from the photos. I probably shouldn't have chosen such a sunny day to photograph them! 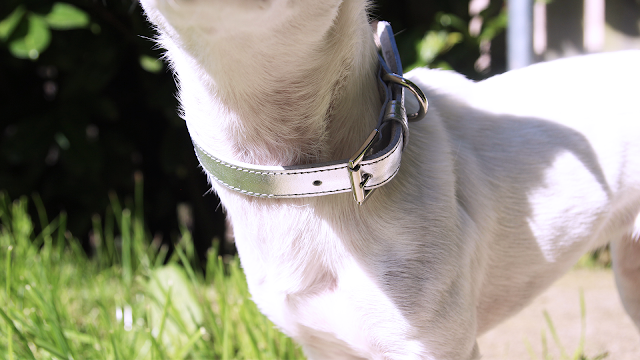 This collar has silver hardware too, which I think matched the metallic leather very well. 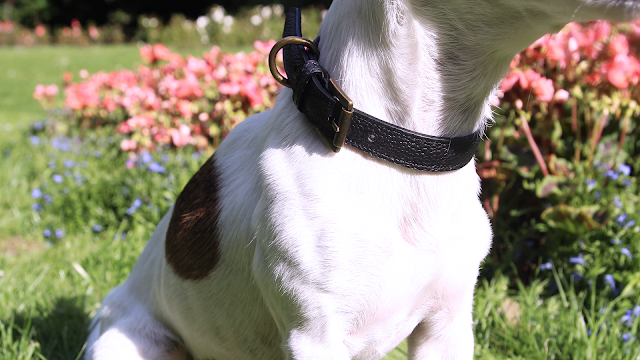 The last collar is this beautifully simple black leather collar with a bit of a twist. It has a pebbled texture, which most definitely made it seem more chic. The buckle has a brass finish, which I also thought perfectly complimented the colour of the collar itself. I think choosing brass over silver made a real difference it how it looked as a whole. 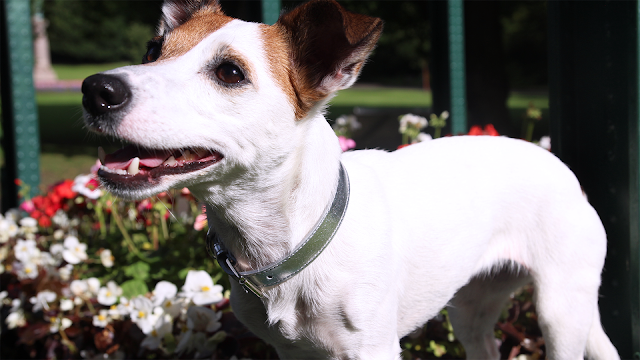 These collars start from £45 on their website, and I would be happy to pay this price. 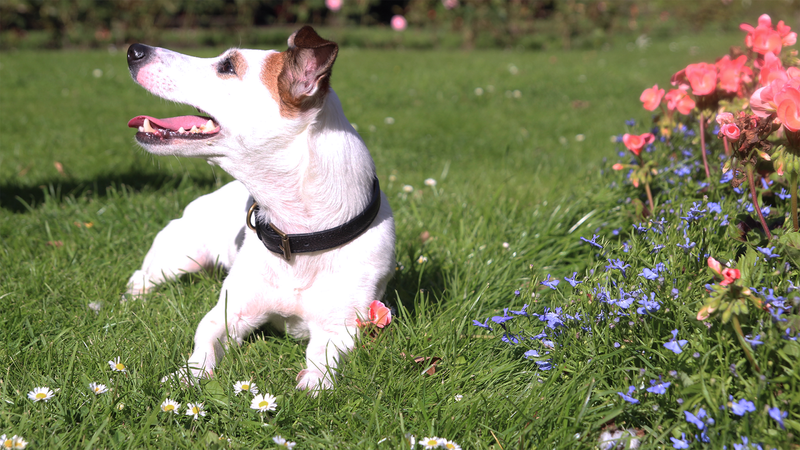 I personally do tend to lean towards the more luxury side of the price range when it comes to my dogs. I find buying better quality products last better in the long run when you own two mucky terriers. I'm very impressed with not only the look of these collars, but with the quality and durability of them; which is something that I am always looking for in collars. 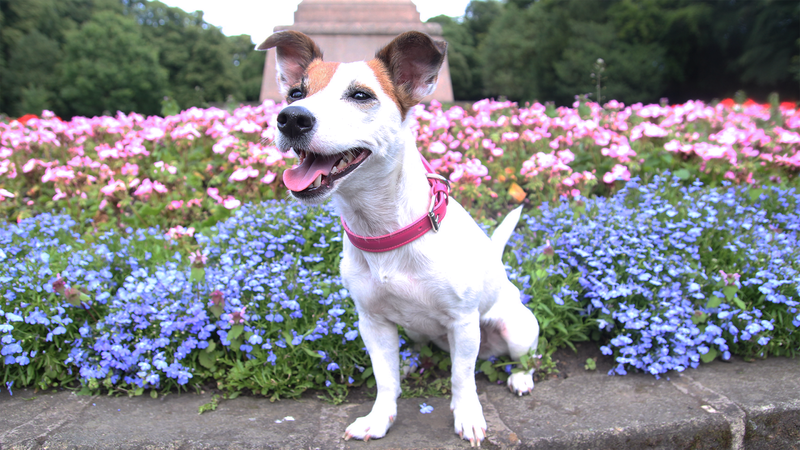 I will most definitely be using the pink collar for Daisy's agility competitions. I like companies that clearly take a lot of pride in what they make and sell. *GIFTED ITEM - please see blog disclaimer. Not paid sponsorship. This post is written by myself and is my own honest opinion. Photos are my own.